Speed dating is one of the many attractions of the largest walking festival in the UK which is on the Isle of Wight 26-29 October and supported by ViewRanger. The festival features over 60 good walks ranging from a short guided fossil hunt to the 'round isle route' which takes several days. According to the organisers the 'speed dating' has proved very successful - with four weddings and a baby - so far from people that popped the question after meeting on the walk. Apparently women always sign-up early and men at the last minute, which gives the organisers a few concerns each year, so if you are an unattached male this is one to consider. 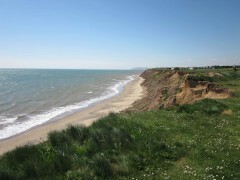 Isle of Wight is famous for its fossils and each day there is a special Fossil Hunting Guided Tour featuring dinosaur footprints and fossil trees. If you can’t make the festival but fancy exploring the Isle of Wight’s fantastic fossil collection, Around the Wight (Part 2): Cowes to Yarmouth walk available to dowmload on ViewRanger also features some excellent fossil opportunities and you can take the walk at your own pace. For the more traditional walkers there are several ‘round the isle’ walks taking place at the festival. Many of the walks are organised by the National Trust, and the local Ramblers Association. All walks are led by local people who love to share their knowledge of the Island with all walkers. If you are visiting the Isle of Wight at a different time, these walks have been uploaded onto ViewRanger and are free to download at any time. The ‘round the isle’ walk tends to take a few days, so if you are planning on stopping over on-route, it would be the perfect opportunity to take advantage of our new partnership with Laterooms.com. Through the ViewRanger app you can quickly find and book a room at nearby hotels with vacancies. The walking festival promises to be an excellent event, for all ages and interests. If you know of another festival that is worth a mention do let us know on Twitter or post on our Facebook wall.